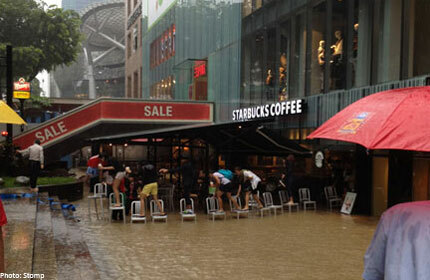 The past two years have seen an increase in the occurrence of floods, especially in the lower lying areas of Singapore. These three episodes are part of a larger pattern of rainfall change in Singapore over the past decades. 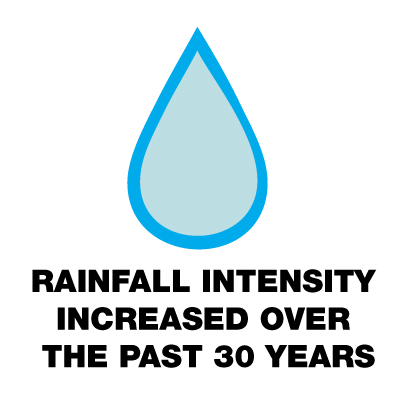 A recent analysis by the Meteorological Service Singapore indicates that rainfall over Singapore has become more intense over the past 30 years. Whilst increased rainfall was expected and managed, the occurrence of flash floods are a recent phenomenon. The Ministry of Environment and Water Resources has been taking action to reduce this (see below), and studies are in place to determine if a costly, sledgehammer approach to the issue of floods will be required. As part of PUB’s efforts to limit damage caused by floods, PUB has been working with building owners at all flood prone areas -to recommend additional preventive measures, to review SOPs, and to ensure that building and renovation plans conform to drainage regulations, stepped up the frequency of cleansing and inspecting of drains to ensure that existing drains are free flowing and perform according to specifications. There has been much speculation on the role Marina Barrage had played on the floods. 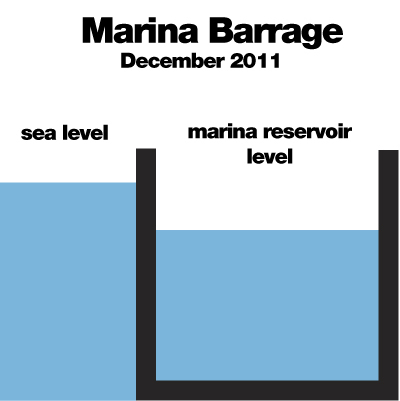 PUB had set the operating level of Marina Reservoir to below mean sea level throughout the month of December 2011. Even on 23 December 2011, despite the major inflow, PUB was able to keep the water level below mean sea level at all times. This is only possible because of the gates and pumps at Marina Reservoir. This removed tidal influence from the various drains feeding into the reservoir and helped keep low lying areas in the city such as Chinatown free from floods. The operations of Marina Barrage, however, do not have any effect in the upper reaches of Orchard Road which are higher, and beyond the ‘zone of influence’ on the reservoir. The silly term “ponding” was introduced by the people at PUB. The Minister of Environment had since rebutted the term and clarified that “a flood is a flood”. Are there other methods to reduce floods? Of course there are – we at Five Stars and a Moon have some ideas that we will share in another post.